NACOGDOCHES, Texas - "Young Talent" is the program theme when guest artist Blake Birmingham performs a euphonium recital at 7:30 p.m. Monday, Oct. 8, in Cole Concert Hall on the campus of Stephen F. Austin State University. 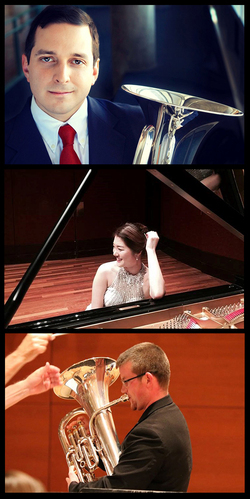 Featuring Birmingham performing pieces from the 2018 and 2019 Leonard Falcone Euphonium and Tuba Competition, the program will also showcase the talents of Hyun Ji Oh, piano accompanist at SFA, and Dr. Danny Chapa, low brass faculty in the School of Music. Birmingham is the winner of the 2018 Leonard Falcone Euphonium and Tuba Festival Solo Artist Division. "We are beyond excited to have Blake Birmingham perform a guest artist recital for our low brass studio this semester," Chapa said. "He recently won first place in the Solo Artist Division of the 2018 Leonard Falcone Euphonium and Tuba Festival, which is one of our most prestigious competitions named after one of the most influential figures in the euphonium world." The program selection "Frevo Para 8 Baixos by Arlindo dos 8 Baixos," arrangement by Caio César, will feature both Birmingham and Chapa on euphonium. "Mr. Birmingham programmed this piece after listening to an album by Fernando Deddos, a well-established Brazilian euphonium player," Chapa said. "Caio César's arrangement of 'Frevo Para 8 Baixos' is a light-hearted piece that highlights the virtuosic capabilities of the euphonium, as it was originally for accordion." Birmingham will perform Barbara York's "Prophesies," which is the piece to be used in the preliminary round of the 2019 Leonard Falcone Euphonium and Tuba Festival. "Who better to perform it than the recent winner of the competition?" Chapa said. The program also includes selections from "7 Popular Spanish Songs" by Manuel de Falla, arrangement by Thomas Ruedi. Birmingham is a freelance euphoniumist, trombonist, low brass educator and composer in the Dallas/Fort Worth area. A graduate of the University of North Texas, Birmingham has performed with The University of North Texas Wind Symphony, The Lone Star Wind Orchestra, The University of North Texas Symphonic Band, The University of North Texas Symphony Orchestra and The Starlight Band. He has also recorded exclusively with The University of North Texas Wind Symphony, Lone Star Wind Orchestra and University of North Texas Symphonic Band. As an educator, Birmingham has taught low brass in Texas, Oklahoma and Arkansas. As a soloist, Birmingham has performed throughout the United States, and also in France. He has appeared as a soloist with the Broken Arrow Wind Ensemble, the Tulsa Community College Concert Band, the Tulsa Community College Community Band, the Timber Creek High School Wind Symphony and the Blue Lake Festival Band. He has won numerous euphonium competitions and is a Besson performing artist. The concert is a joint presentation of the College of Fine Arts and School of Music. Admission is free. For more information, visit http://www.finearts.sfasu.edu/.